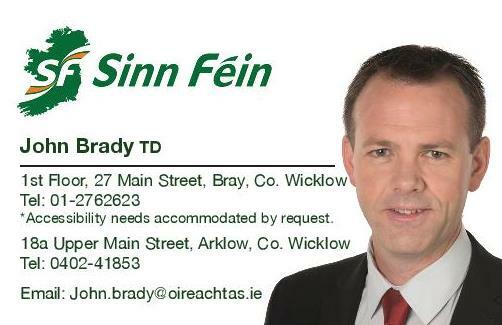 Sinn Féin TD for Wicklow/East Carlow John Brady has said that the actions of Minister Naughten to dismiss concerns surrounding wind turbines will have grave repercussions for the people of Wicklow. “The newly adopted Wicklow County Development Plan 2016-2022 includes very clear and specific conditions to be adhered to when it comes to the erection of wind turbines in the County. “One of these conditions set out by the Council is that wind turbines are not to be developed within 1km of residential areas. This condition was put in place as a response to the well-known concerns of locals throughout the county and therefore, as a means of protection for people’s homes. “This protection was extremely valid and I welcomed this condition as being absolutely necessary. “On Friday last, the Minister for Communications, Climate Action and the Environment, Denis Naughten issued a Ministerial directive removing this condition from the County Development Plan. “The fact that Minister Naughten has stepped in and gone over the heads of the Council Councillors while at the same time dismisses the legitimate concerns of the people is appalling. “I will be contacting the Minister directly to voice my concerns on the removal of this condition and I will also be making a formal submission to the Planning Authority in this regard. “I encourage members of the public to write a submission to the Planning Authority between December 14th and January 5th 2017 requesting that the condition regarding a setback distance of 1km from people’s homes is maintained in the County Development Plan.